I chose to take two of the pumpkins from the set and color them up with Copics and the mount them on my own homemade pumpkin. I'm feeling particularly brilliant with this one :) I cut out 3 ovals with my Spellbinders, sponged them well, and then place them together to form the pumpkin, then I took one of the Floral Accent Shapeabilities to be my Pumpkin stem, cute hey? A little gingham ribbon tied on it and it's really festive. I also added a new product to the Flourishes store, some really cool mosaic tiles to accent the ruffled ribbon. Isn't it neat. They come in wonderful colors and you can use a whole row of them, or just a few, and they come in two different sizes too. So, tell me what you think of this cute set, and leave a comment here with your email to win some birthday blog candy I have for you.... one winner will get your choice of either the Swan Lake set or the Lace Edges Set :) I'll announce the winner on Monday! Happy Birthday Flourishes! Now you'll want to stop by all these girls to see their creepy creativity and you'll find some more blog candy opportunities along the way.....and don't forget to enter to win this set at the Flourishes Blog! Recipe: Stamps: Witching you a Happy Halloween; Ink: Memento Tuxedo Black, Pumpkin Pie, Paper: Basic Black, Wild Wasabi, Pumpkin Pie, Flourishes Classic White; Accessories: Big Shot, Oval Nesties, Floral Accent Shapeabilities, Victorian CB Folder, Sponge, Orange and Black Gingham, Scor Tape, Mosaic Tiles, Dimensionals, Copic Markers, Fancy Labels Shapeabilities, Word Window Punch, Corner Rounder Piercer. This is absolutely adorable, love how you created this pumpkin and the stem. 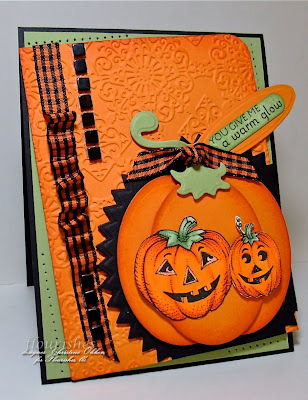 Sweet card - love how you did the big pumpkin, love all the texture!!! This is darling! Love the new pumpkins set on top of your pumpkin! Very cute! Orange you smart -- Making your own pumpkin!!! Love it with the images on top. I love this Halloween Card. It is really cute. The card is so darn adorable!! love the ribbon treatment and all the texture you have added. I just love the way you did your homemade pumpkins. Brilliant card! I really send Halloween cards but this set is lovely! 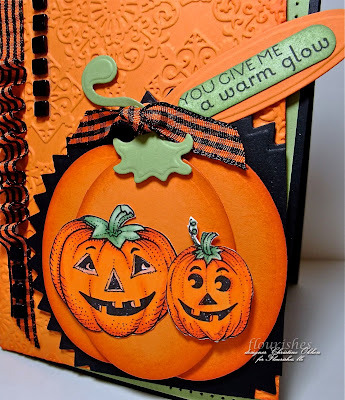 I really like your ribbon treatment and the texture in the background, and those cute little pumpkins!! This is awesome! I love the texture and the way you did the big pumpkin. Halloween is my favorite time for crafting! Love the images in this new set. The little witch feet are just too cute! Oh now this is cute, love that background! Gorgeous!!! Love the pumpkins...and the little tiles are a great addition! WOW - these colours are so bold and dramatic!! What a fabulous card!!! 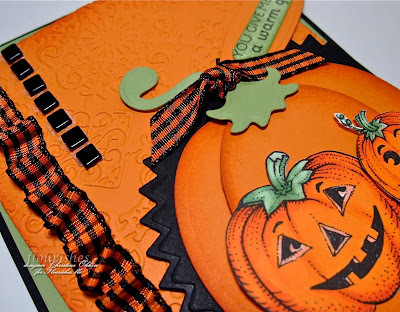 Love all the detail in this card, the way you did the ribbon, the stem, the pumpkins. Did I say I love this card? This set is very cute, I can't wait to order the apple set, just gorgeous on that one also. Creepy cuteness! LOL Love the mosaic tiles and your flat/ruffled/flat ribbon treatment. 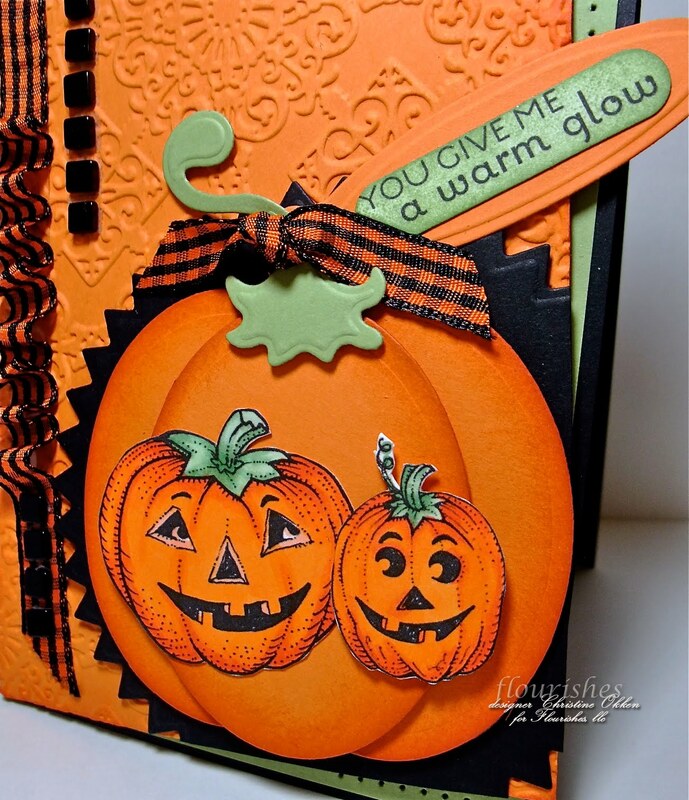 Love the colored pumpkins on the pumpkin die cut (that stem is darling!!). Absolutely beautiful!! I will be cutting a lot of ovals this fall and have to buy the set. so cuuuute! love how you ruffled the ribbon and the embossing folder is great too! I love the Halloween set. I can't wait to get it. Your card is very cute! Darling card! Very nice detail on the card. Love this stamp set. love the pumpkins made of ovals - what a great idea - this is such a cute card!! Adorable card! I love the way you created the pumpkin with the oval nesties and then popped up the stamped pumpkins. Your ruffled ribbon really makes the card pop! Love your oval pumpkin...it's such a fun backdrop to the jack o lanterns. Awesome card, fabulous details! Very clever! I plan on stealing your pumpkin idea immediately! I don't think I'll be the only one, either! Thanks for sharing your talent with us all! I love the oval nesties used to make the pumpkin. Brilliant! I love the card! The pumpkin you made is wonderful and the stamped set on top really sets it off. I really like the mosaic tiles with the ribbon. Waht an adorable card. Just love the pumpkin. Your pumpkin is genius...I do love the texture the ovals provide...and the ruffled ribbon and mosaics give it so much interest...a very pretty pumpkin card, Christine!! That pumpkin you made using the ovals is genious! Great coloring on the other pumpkins too. This is way cute! Loving these stamps! You are brilliant.. I love your creativity with the spellbinders. It is fun to find a way to use them outside of the norm.. Great job Christine. that's a really bright card. Love your composition. cute. Flourishes Stamps sets NEVER disappoint....I Love them all!!! What an adorable card. I love how you used the pumpkins. This is stunning and adorable Christine!! LOVE the bright colors and your layout with the ribbon and texture. Great layout! Love the embossing behind the pumpkins. Great card! Pumpkins are just about my favorite autumn thing. The gold orange color, the interesting shapes,and of course the possibility of some spicy pumpkin bread or pie! What's not to love? Your card "gave me a warm glow". I can't wait to try that nestie pumpkin! Awww, love it! So sweet, and I love your big pumpkin too. Fantastic coloring. Love your card and especially the "home" made pumpkin with the smaller pumpkins on top.So cute! What FUN! Love your creative & inspirational & "enabling" style Christine! Fabulous coloring & textures! I love how colorful this card is. Very cute! Love your card - very clever pumpkin & lovely coloring. Thank so much. Your pumpkin is so cute, very creative idea. The ribbon treatment is awesome! 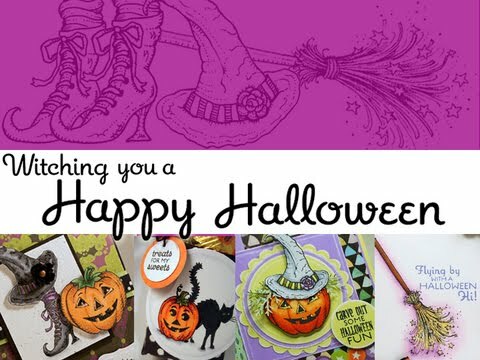 Love your whole Halloween card, but especially what you did with the ovals to make the big pumpkin!! Perfect for Halloween and stylish and classy too. Nice work. I love this set, and your card looks great with the jack-o-lanterns in front of the punch art pumpkin. The mosaic tiles are a really cool touch too! I love your layout for this part of this delicious set! I see all of these pumpkins layered on top of the larger pumpkin and think pumpkin pie, pumpkin muffins, bread... I love Autumn! I really like those new tiles! I am so glad you shared them with us. That ribbon is perfect for the card, also! Such happy little punkin faces! Fun, fun, fun! I love the Halloween card with all the special details!! This card certainly glows with warmth, Christine! Love how you did the pumpkins on a pumpkin. CUTE! Wonderful texture and details! This is such a fun set. Love your pumpkins on the card. I've loved seeing all the new releases. What a creative way to make a pumpkin. Very clever! Beautiful cards.